Court has the eye of an artist and the soul of a sailor. I was searching for a gift for my mother and father-in-law to memorialize the 13 years my family has gathered in Cape Cod, and was referred to Court and Uncharted Mapping. I wanted something that tied the family to the place, incorporating the town where we stay, the nautical feel of the cape, and the joy of the family gathering. Court's creativity and technical know-how produced a piece that far exceeded my hopes. It was wonderful working through the process, and Court was so patient as I relayed my ideas. The finished product hangs beautifully in my in-law's home, standing as a testament to the many wonderful memories and years we've spent together. I could not recommend Court highly enough! Working with Court and Uncharted Mapping on my husband's birthday gift was a great experience. 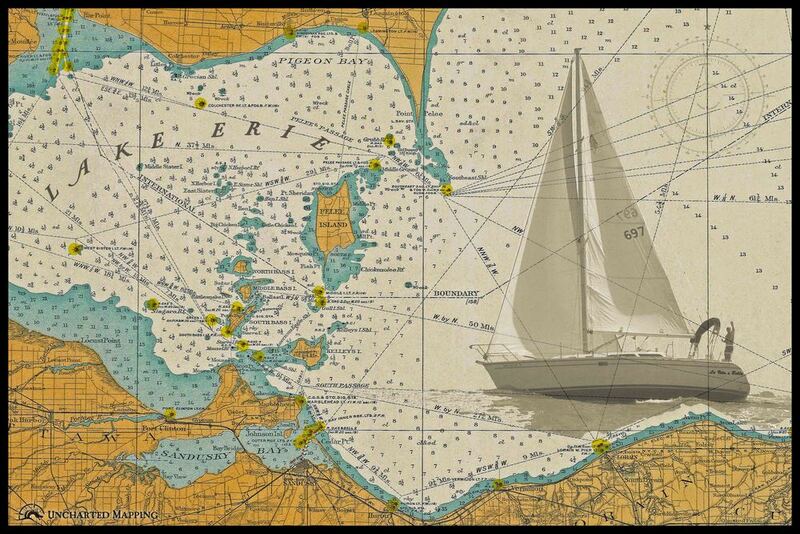 The folks at Uncharted Mapping understand the sailing and boating lifestyle and what our photos and memories really mean to us. Court knew the importance of the photos I sent him and he found a way to make them not only work, but immersed them into the chart of our cruising grounds. The color palette is absolutely perfect and each time we walk into our living room we are transported back to the West Side of Kelley's Island at sunset. Tell Court your story and you will get amazing results. We saw a canvas at an art show of a ship from the re-enactment of the Battle of 1812 overlayed on an antique map of the islands. My husband was actually on The Pride of Baltimore ship in the battle. I wanted something that incorporated the Pride for my husband’s birthday. Court worked with me to personalize a canvas with the Pride of Baltimore in full sail with a cannon plume overlayed on the antique map. He did it in record time and the finished product looks amazing!! I am sure my husband will be thrilled with the finished product and it will be a wonderful remembrance of his part in the re-enactment. Many kudos to Uncharted Mapping and Court Smith! Court at Uncharted Mapping found us an old map of Dayton which we loved. Unfortunately, it was in very poor condition but Court did an amazing job restoring it to its former glory by removing all of the folds and tears. He then tastefully incorporated a picture of our 115-year old house into the map along with the iconic Wright Flyer. The framed piece hangs in our living room, and is frequently the subject of interested conversation with our family and neighbors. We love it! We worked with Court to design our map and are delighted with the outcome. He is very nice to work with and his service is very timely. We would highly recommend him to anyone interested in this type of product. It looks great on our living room wall!